I seem to remember we have had scenes of rapt audiences on wintry nights in previous Blogvents. There is something about the darkening afternoons and cosy evenings that inspires the spinning of tales from the smoke and embers of our crackling fires. Here we have a group of Russian women not telling stories, but casting the futures of the assembled sisters. I was frankly a bit puzzled by the chicken, but having done a moment's searching, I think the young ladies are practicing the 'hungry chicken'. Now, what you are supposed to do is this, and please feel free to try this at home: You will need a bowl of grain, a bowl of water, a mirror, and one chicken. Unmarried lady holds on to chicken while a mirror, a bowl of grain and a bowl of water are laid out on the floor. Chicken is unleashed and the bird's preference is noted. If the chicken pecks the mirror, the woman's future husband will be vain. If she pecks the grain, the husband will be rich. Unfortunately if she pecks the water, he will be a drunk. 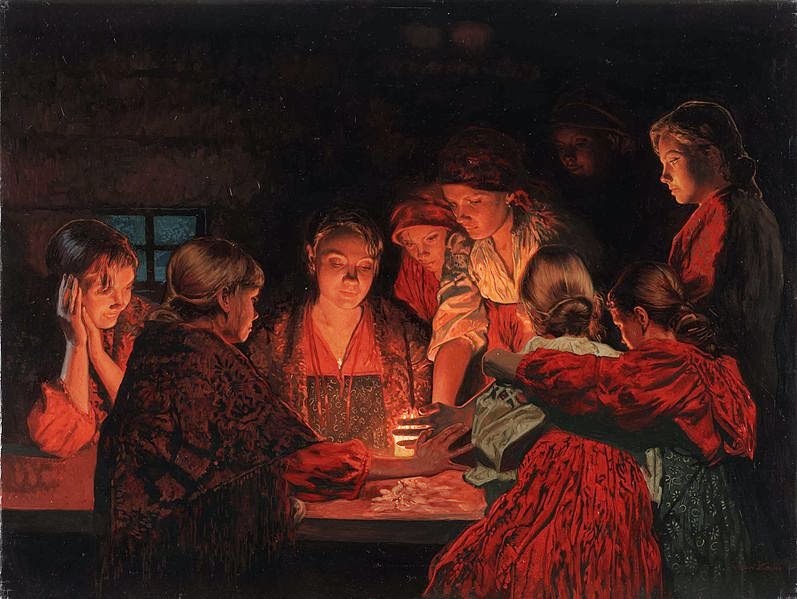 Young, mainly unmarried, women gather in the 'banya' or bath-house and the fortune telling begins. The women in this very nice modern canvas seem to be staring into the flames of the candle. You are meant to be able to see what the next year will hold. Most women hope to see the handsome, not drunken, face of their fairly affluent future spouse, but if you see a coffin, you are done for. Most women report seeing their husband, oddly enough. Well, I'm off to bring Cagney, my chicken in to the house so Lily can find out who she will marry. I'm not sure that just the three choices of husband are enough - surely there are gentlemen who fall outside the categories of rich, vain or drunk? Mr Walker doesn't fall into any of those. In my case, I should have had a fourth bowl, full of Hobnobs. Then I would have known I was going to marry a museum curator. As you mention one chicken named Cagney, may we assume Lacey has recently gone into the Christmas stock pot? Yes, Lacey died from old age this summer after around six or so years of loyal service. We now have Faith, Hope and Charity to keep Cagney company. She keeps them all in line and is enjoying a second childhood. She stopped laying eggs years ago but is a fabulous pest control expert. She once got into the washing machine in pursuit of the biggest spider I have ever seen. Good hen. 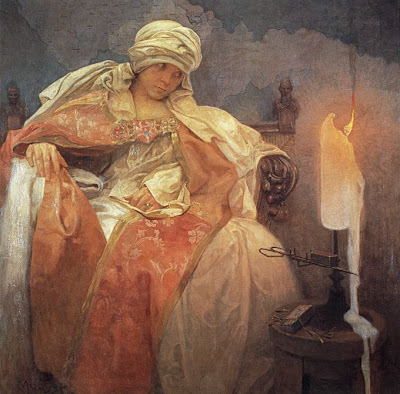 It's so brilliant to see new pictures, l love the light in the "Divination", and the Mucha is interesting too. Pity Cagney is so far from where I live, since my son left home spider disposal post is empty! It's nice to see a Mucha oil painting - most of what we see from him are his highly popular commercial illustrations - beautiful, but not all he produced.